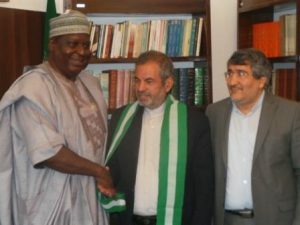 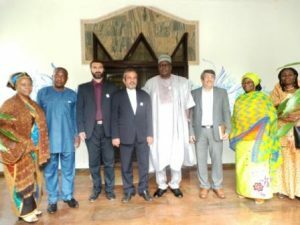 L – R: Otunba Olusegun Runsewe, OON, decorating HE, Amb Mortega Rahimi Sarchi at the Embassy of the Islamic Republic of Iran, Abuja. 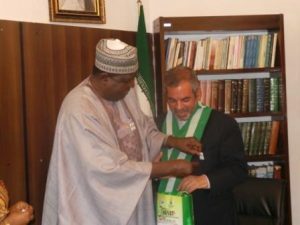 L – R: Otunba Olusegun Runsewe, OON, decorating HE, Amb Mortega Rahimi Sarchi with the Council’s Pin Crest at the Embassy of the Islamic Republic of Iran, Abuja. 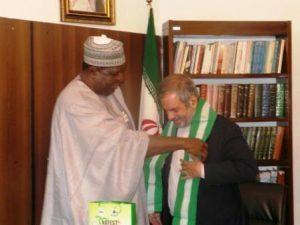 Otunba Olusegun Runsewe, OON, in a warm handshake with HE, Amb Mortega Rahimi Sarchi at the Embassy of the Islamic Republic of Iran, Abuja.